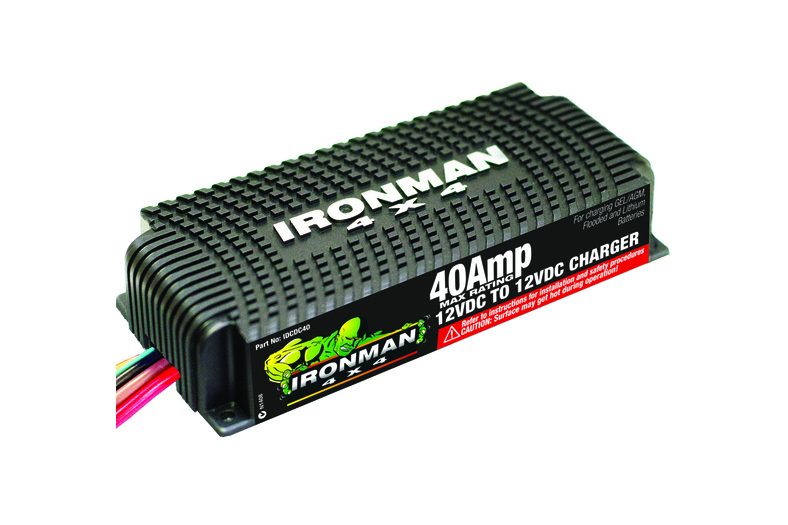 The new Ironman 4×4 DC to DC 40amp boost, 3 stage battery charger. With the new generation of vehicles it is important to ensure that auxilary battery charging is managed in a way to maximize the charge. The Ironman 4×4 DC to DC 40 amps chargers uses the latest generation technology producing more power in a much smaller compact unit. The DC to DC charger is able to cope with under bonnet heat, vibration and has a unique heat sink to maximize cooling and maximize efficiencies. This DC to DC charger is encapsulated in a weatherproof polymer. The Ironman 4×4 DC to DC charger has a remote dash mounted LED to indicate charge status. A fantastic feature is the selectable battery selection with the ability to charge all types of batteries, including FLOODED, AGM, GEL and Lithium. This charger is designed to manage and maximize the charge to your batteries.